Winter means comfort food. My comfort food is unusual ……fried shrimp. As a child this was hands down my favorite food. Whenever we went to a restaurant I ordered fried shrimp. I considered myself a young connoisseur of sorts, comparing my fried shrimp food experiences from place to place. So no surprise here, that I take my version of fried shrimp seriously. I like the fried breading to be slightly and crispy. This requires very hot oil to fry the shrimp quickly without over cooking the interior. To that end I just received for Christmas a deep fryer, but without s deep fryer I was always able to accomplish the right results in a frying pan. All I can add is that you will love discovering this comfort food recipe. From by the bay, wishing you deep fried shrimp food memories! In a small mixing bowl, combine all ingredients. Chill before serving to let the flavors combine together. Use paper towels to pat the shrimp dry. Gather three shallow dishes. I like to use pie pans. In one pan, add flour, salt and pepper and combine. In another pan add the eggs and beat lightly. In the third pan add bread crumbs. Dip each shrimp in flour, then egg, then bread crumbs. Use your fingers to press the bread crumbs onto each piece of shrimp. 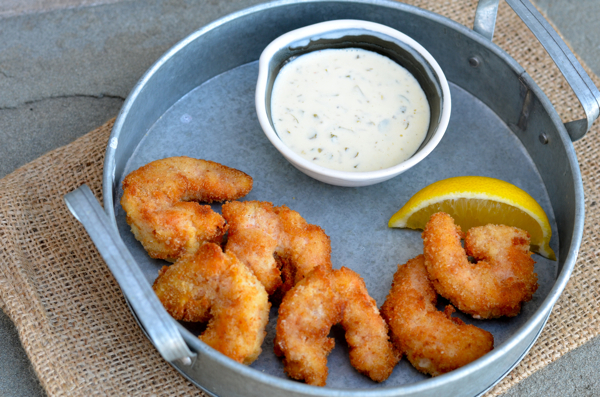 Place breaded shrimp on a baking sheet. Heat about two inches of canola in a deep pot to around 350 degrees or use a deep fryer according to instructions. Deep-fry the shrimp in batches, frying about 6 shrimp at a time. The shrimp will cook very quickly! When they are golden brown, use a slotted spoon to remove them from the pan, and transfer them to a paper towel lined plate. Continue cooking the shrimp in batches until all shrimp are fried and golden brown. 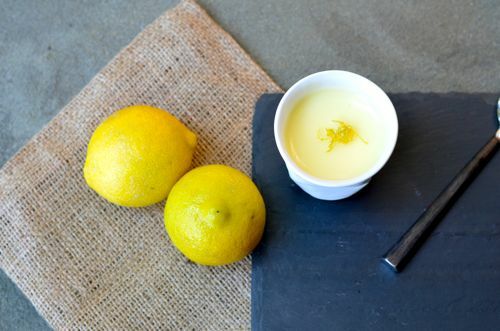 Serve with lemon slices and homemade tartar sauce. This entry was posted in main dish, seafood and tagged capers, comfort food, fried shrimp, fried shrimp with homemade tartar sauce, lemon recipes, pickles, sauce recipes, shrimp recipes, tartar sauce on January 20, 2016 by entertainingbythebay. I was craving a lobster roll, but that takes money, time and some real commitment. This is the lazy girl’s lobster roll, but without compromising taste! 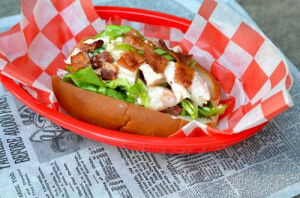 The shrimp are easy to make and if you are even more lazy and sometimes I am , I buy the shrimp already cooked, in which case you are whipping up this shrimp roll in minutes……..held back by how fast you can crisp up those slices of bacon!! The roll has a slight kick from the hot sauce the a fresh tangy taste from the lemon juice. This is a perfect quick summer dinner especially on those hot evenings when you don’t want to spend much time in the kitchen or at the grill! From by the bay , wishing you some BLT food memories! In a stockpot add about 2 quarts water salt and bay leave. Bring to a boil. Add shrimp and cook until they turn pink. Strain removing bay leave and cool shrimp under cold running water to stop from cooking. When shrimp are completely cool chop and place in bowl along with 1/2 of the chopped scallions. In a small bowl add mayonnaise, lemon juice, hot sauce, mustard and pepper. Whisk together and pour over the shrimp. Fold sauce and shrimp together. To assemble sandwich open the bun and add 1 slice lettuce, 1/4 chopped tomato, 1/4 shrimp salad. Repeat for remaining shrimp rolls. Garnish each roll with remaining scallions and chopped crispy bacon. Serve immediately. 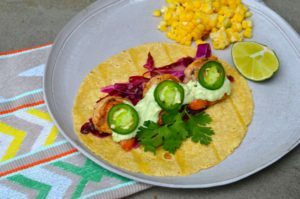 This entry was posted in main dish, seafood and tagged bacon recipes, seafood recipes, shrimp recipes, shrimp roll recipe, shrimp salad recipes, summer food, summer recipes on July 17, 2014 by entertainingbythebay. I got up early the other morning and when straight to the farm stand. I just love this time of year, especially the corn. I found some beautiful ears of butter and sugar corn which is a mix of yellow and white kernels. I wanted the corn to be the star of my dinner that night so I decided to make shrimp and grits. 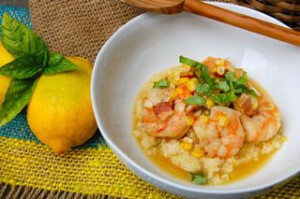 In order to have the delicious corn taste enhance each part of the dish, I shucked the corn to mix into the dish at the end and also make a corn stock that I used to make the sauce for the shrimp as well as to cook the grits. I finished the dish off with some fresh basil from my garden. The results were terrific. Don’t be daunted by the steps, they are all easy and go quickly, so definitely try it out. 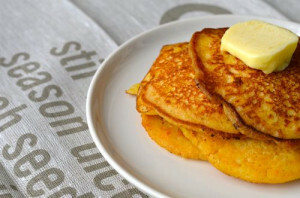 From by the bay wishing you butter and sugar food memories! bowl, with a knife. This makes for an easy clean up afterward. In a stock pot add all ingredients and bring to a boil. Simmer for 10 minutes. Remove from heat and cool. Remove the cobs from the stock and discard. 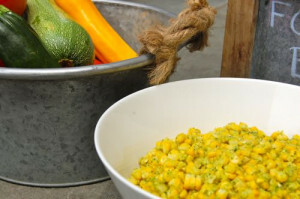 Place remaining stock and corn into food processor and puree. Strain and keep stock to the side. You will have about 3 1/2 cups of stock. If you have less use less stock in the grits and add more water. Note: This can be done in advance, earlier in the day. In a large sauce pan 4 cups of liquid in total – add stock, water, salt and pepper. Bring to a boil. Add grits and cook uncovered for about 20 to 25 minutes until liquid is absorbed into the grits, stirring occasionally so grits don’t stick to the bottom of the pan. Remove from heat and add the butter and cheese, stirring well. Optional : Right before serving add 2 tablespoons of the corn stock or olive oil to loosen the grits. Place a large saute pan on medium heat and add the bacon and cook until crisp. Use a slotted spoon to remove the bacon and drain on a paper towel. Set aside. In the same pan saute the shrimp until they turn pink, cooking on both sides. Do not over crowd the pan. Remove the shrimp and set aside. Leave about 1 tablespoon of the bacon fat and add the garlic, green onion and corn. Saute for about 2 minutes until softened, then add the corn stock and lemon juice bring to a boil and add the shrimp and bacon, mix well and remove from the heat. 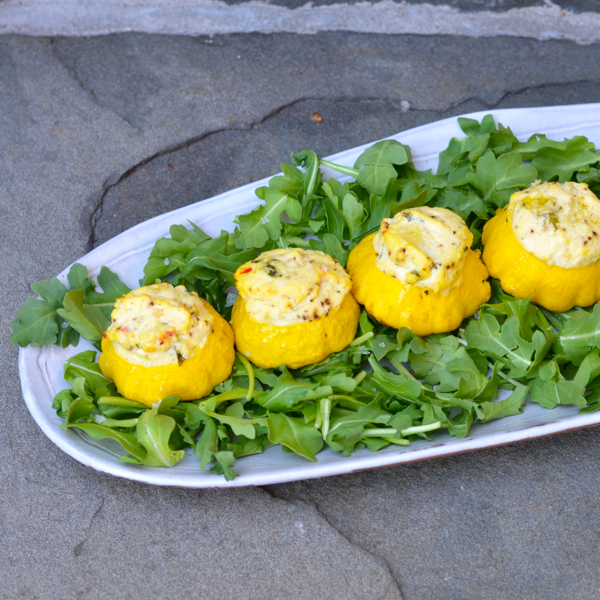 Serve on top of the grits and top with chopped basil. 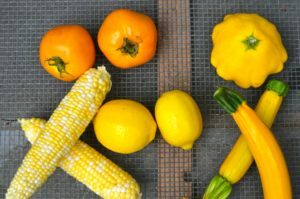 This entry was posted in main dish, seafood and tagged bacon recipes, corn recipes, cornmeal recipes, grit recipes, seafood recipes, shrimp recipes, summer food, summer recipes on May 24, 2014 by entertainingbythebay. Growing up if you asked me my favorite food , there was only one answer: Shrimp – lots of it fried. i considered myself a fried shrimp connoisseur in those days. Although, i have really expanded my food horizons, shrimp is still one of my favorite foods and I am always looking for new ways to prepare them. I first tried Harissa, a spicy paste, on a buying trip to Paris and I have enjoyed experimenting with it as an ingredient ever since. You can find Harissa as a paste in either a tube or can from food specialty stores. It is from North Africa and it is made primarily of chili peppers and garlic along with cumin and coriander. It’s a great quick way to add heat to a dish. My favorite use is in this shrimp dish. The Harissa mayonnaise is also a great complement to potato fries, with grilled meats or to use on sandwiches. From by the bay wishing you spicy food memories! Place all ingredients into a sealed plastic bag and marinate for at least 2 hours. Soak wooden skewers in water for one hour. 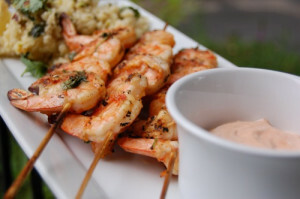 Heat outdoor grill or grill pan, skewer shrimp and grill shrimp approximately 3-4 minutes per side until pink. Serve with Harissa mayonnaise. This entry was posted in main dish, seafood and tagged cilantro recipes, grilled shrimp recipes, harissa mayonnaise, harissa recipes, lemon recipes, shrimp recipes, spicy recipes, summer food, summer recipes on May 24, 2014 by entertainingbythebay.